Copper peptides touch on a bunch of recent discoveries in hair loss research. 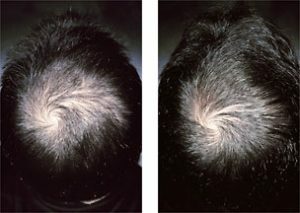 For decades, androgenetic alopecia (male and female pattern hair loss) has been blamed almost entirely on hormones. Dihydrotestosterone (DHT) – closely related to testosterone – is said to bind to hair follicles, causing them to shrink and stop producing hair. However, there are many problems with this explanation, and new research has revealed the situation to be a little more complex. A 2012 study, for example, first introduced us to the role of prostaglandin D2 (PGD2) in pattern hair loss. Further, new research is uncovering the potential of the wound healing response to regrow lost hair. Bald scalps have also been found to have higher levels of inflammation and fibrosis. There is evidence to suggest copper peptides may help on all these fronts. And some studies even claim it’s as effective as the FDA approved hair loss treatment minoxidil. Copper peptide GHK-Cu has anti-inflammatory, antioxidant, and anti-aging effects. It’s been shown to encourage wound healing and promote stem cell activity. It may even help prevent cancer1. These anti-aging properties mean GHK-Cu has become a popular ingredient in facial cosmetics. And these same properties may also make it an effective hair loss treatment. Trials in both animals and humans have established that GHK-Cu helps the body recover from injury. When applied to skin, it activates pathways associated with wound healing, stimulating the synthesis of collagen and increasing stem cell activity in the area. Interestingly, these are the same mechanisms through which microneedling is believed to regrow hair. The mild physical trauma caused by the derma roller encourages the body’s natural healing abilities, leading to hair regrowth. In theory, you could get these same benefits from GHK-Cu without the pain of microneedling. Another mechanism through which copper peptides may reverse hair loss is by breaking down fibrosis in the scalp. Fibrosis is an excess of collagen – scar tissue – in the body. It’s an often overlooked fact that bald men’s scalps have four times the level of fibrosis compared to non-bald controls. If you’ve ever had a scar you’ll know hair no longer grows in the area of the scar, and it seems something similar is happening with androgenetic alopecia. The excess collagen reduces blood flow and gives the scalp a hard and shiny appearance. For a more detailed look at the link between pattern hair loss and fibrosis, click here. But collagen isn’t bad per se when it comes to hair loss. It’s the permanent excess of collagen – i.e. fibrosis – that’s the problem. Copper peptides have been demonstrated to stimulate both the production and breakdown of collagen1. Collagen is initially needed to heal wounds but the same systems activated by copper peptides also remove excess collagen when it accumulates. Medical studies, as well as anecdotal reports online, attest to the scar-healing abilities of collagen peptides. This suggests copper peptides may help break down fibrosis in the scalp too. Do copper peptides work for hair loss? But what about human hair? The dermal papilla is what regulates the development and growth of hair follicles. When mature, it instructs surrounding cells to proliferate and differentiate to create hair. If copper peptides result in more dermal papilla cells, as suggested by this study, then it seems likely they may encourage hair growth too. In fact, multiplying dermal papilla cells is one of the proposed methods for hair cloning. Aside from these two trials, another promising study of copper peptides for hair loss is the story of Tricomin. Tricomin is a copper peptide-based spray developed by ProCyte corporation. It was initially intended to be launched as an FDA approved hair loss treatment – even completing FDA stage 2 trials. However, ProCyte never advanced Tricomin to stage 3 trials, perhaps for financial reasons. Even so, anyone who knows the FDA approval procedure knows even reaching stage 3 is something of a success. The results from the trial (pictured) suggest it was roughly as effective as 2% minoxidil. Copper peptides are among the many products out there that may help with hair regrowth. We know they play an important role in wound healing. 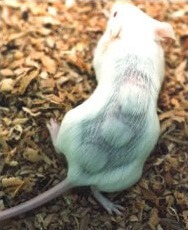 We also know that the wound healing response can cause hair regrowth. Copper peptides may also reduce fibrosis in the scalp, perhaps as part of this wound healing response. While this bodes well for copper peptides, the limited studies on androgenetic alopecia suggest they are not a miracle hair loss cure. The photos of mice growing hair and observations of increased dermal papilla cells are certainly positive. But if copper peptides really were a silver bullet for hair loss, ProCyte would surely have advanced Tricomin to FDA Phase 3 trials. As for whether copper peptides are more effective than minoxidil, the answer to this is likely to vary from person to person. However, since copper peptides appear to have a different mechanism of action to minoxidil, it may be possible to achieve better results by using both treatments in conjunction. Questions about copper peptides for hair loss? Ask them in the forum! maybe these will work for me please email i have loss! my wife likes to say the same! i joke of course but there are many unknown on the hair a mystery of life. maybe if the scientists try to cure ! hey there, great article! Copper peptides multiplying derma papilla cell? Sounds awesome. I’ve found this company, how do they sell if they don’t have FDA approval?